Illustration courtesy of Fiocchi Ammunition. I've been using Fiocchi Golden Pheasant loads ever since they came on the scene, and they have done a fabulous job on Illinois pheasants. I was disappointed to learn that one of my favorite rooster loads, the Fiocchi 12 gauge Nickel-HV load has been discontinued, as that beautifully balanced load has never failed to perform for me. 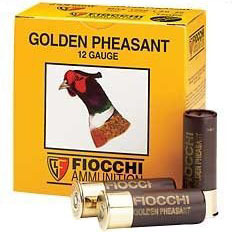 However, the Fiocchi Golden Pheasant line continues to expand, and Carlo Fiocchi mentioned at the 2006 SHOT Show that even more loads are on the way in the near future. When I was growing up, it wasn't unusual to walk standing corn and ditches without dogs, the pheasants were that plentiful. For 100% recovery of a pheasant, you need to break a wing and a leg. If he falls dead, so much the better, but even if that bird has only a few moments of life left in him he can easily dig his way deep into the grass or run enough to puzzle most hunters, especially the easily puzzled such as myself. I don't want to lose a pheasant for a lot of reasons, but as "pheasant and wild rice under glass" is a dish not to be missed, that is sure one of them. When walking standing corn sans dogs, it was S.O.P. to pop them once on the flush and once again on the way down. No way could we risk a pheasant that was not anchored exactly where he dropped. It may have taken a few more moments to clean them, but we seldom went hungry. Shotshells have improved substantially since those roll crimp, paper shell days. It has become apparent over the years that for a tough wild bird with his winter feathers on, nothing beats nickel-plated shot. High antimony content, nickel-plated shot clearly out patterns and out performs standard lead shot, and even copper-plated shot as far as I'm concerned. Although, admittedly, some buffered copper-plated loads have done admirably as well. 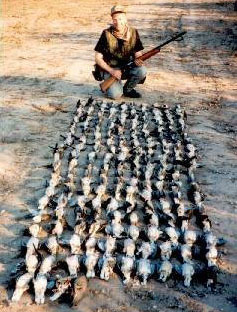 Randy with a pile of doves that fell to Fiocchi shotshells. Photo courtesy of Randy Wakeman. It is nickel-plated 3.2% antimony shot that made the Fiocchi nickel high-velocity loads so good, along with excellent quality control, and it is the same nickel-plated shot that helps make Fiocchi Golden pheasant loads such good performers as well. Number 5 lead shot has proven itself to be the first choice for general pheasant use, though I'll opt for #4's in 12 gauge for extremely late season hunts. The three standout GP loads, in my opinion, are the 12GP (1-3/8 ounce), 16GP (1-1/8 ounce), and 203GP (3" 20 gauge, 1-1/4 ounce) all in #5 shot. The 12GP is a tad heavier than the old 1-1/4 ounce #12HN5 loads, but the nickel plating also acts as a lubricant for the pellets. It patterns just as well, if not a tad better, in most 12 gauges in which I've tried them. I've always been a sixteen gauge fan, and while not every 20 gauge will pattern well with #4 (or even #5) shot, I've yet to find a 16 gauge that won't. Often, I've heard the comment that 16 gauge ammunition is hard to get. Nothing could be further from the truth, as Fiocchi loads not only the Golden Pheasant line, but also their 16HV (1330 fps), 16FLD (1185 fps), and their soft-shooting 1 ounce 16 GT line, covering the gamut from #9 all the way to #4 shot. For some reason, folks seem to think that when a load is designated "pheasant" or "turkey" on the box, that's all it is good for; but we all know better than that, don't we? Golden Pheasant loads have bagged a lot of turkey as well. If you've not yet taken advantage of Fiocchi nickel-plated loads, you'll want to give them a go. It means better patterns and more birds, cleaner and faster than with soft-shot promo shells. Unlike many manufacturers, Fiocchi lists the antimony percentage of the shot used in all of their loads, and the respective standard deviations as well, so you know what you are shooting. The pattern board tells you the rest.